Max. Power: 40 hp / 130 lbs. 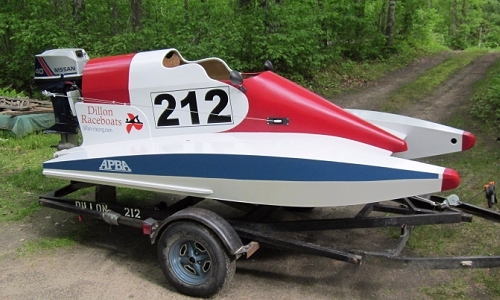 The Dillon Sport C tunnelboat was designed and built for racing in the APBA Sport C class. Sport C is a national class which allows for several boat and motor options, but the typical rig is a tunnelboat approximately twelve feet long, powered by a two-cylinder, 40hp Nissan or Tohatsu outboard. More about Sport C racing HERE. 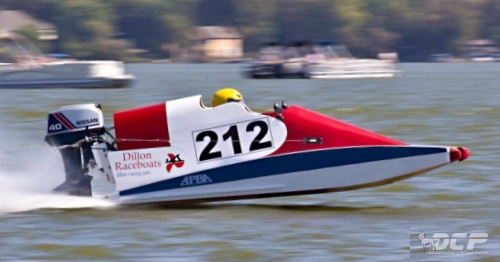 APBA rules require a reinforced cockpit in Sport C boats. I outfitted the original Dillon Sport C with a composite-built cockpit of my own making. Plans for the Dillon Composite Cockpit are now available, and since the Sport C was designed around it, it is perfectly suited to this boat. The plywood cockpit described in the plans is perfectly suited to the non-racer, and also can be adapted for racing use (see the Construction Notes). My first year racing the Dillon Sport C was not impressive in terms of race results -- I generally finished last. 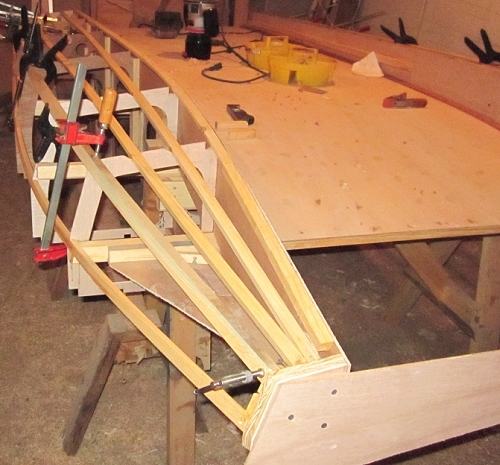 Nevertheless, I am very happy with the way the boat functioned, and I'm confident that further work on propeller and setup will improve performance and make my boat competitive. Using a round-tipped cleaver from Ron Hill, I was able to run at speeds of 54-55 mph. The ultimate goal will be to run in the 58-59 mph range, and I believe my boat is capable of that -- but it will likely require a significant investment in a professionally-worked propeller. The Dillon Sport C is my second attempt to build a Sport C racing boat. The first project did not work out in the end, but its failures (and successes) informed the design of the new boat and have lead me to this point. You can read about the earlier project HERE. The Dillon Sport C was designed for speeds up to 60 mph using the lightweight (130 lbs.) Sport C motor. A heavier and more powerful motor would likely require some re-balancing; for instance, moving the seat forward a foot or so. Speeds much over 60 mph are not recommended. Because of the aerodynamic lift generated in a boat like this, hydraulic trim to keep it under control is virtually a requirement. I built the original Dillon Sport C with white pine stringers and (mostly) 5mm (3/16") exterior-grade plywood. I recommend 5mm (marine or exterior) plywood for most of the hull plus 3mm marine for the deck and front cowling. Many will state that marine plywood is the only choice. But though I've seen failures in exterior plywood, I've seen virtually identical failures in marine. Exterior grade plywood requires good structure (stringers and bulkheads) behind it, but I would stipulate that marine plywood calls for exactly the same. That said, you can hardly go wrong using okoume marine plywood. But you can save a few hundred dollars by using locally available, exterior grades. It's your choice. video -- advance to 16:40 to see the Dillon Sport C in the last heat. Crashing at the Nationals in Kankakee, IL, September 2012. About the Plans: I am not a naval architect, or an engineer, or even a draftsman. I am a forester by education, a furniture-maker by profession, and a boat-builder, sailor and racer by inclination. I have built a number of boats over the last 35 years or so: from the 8-foot hydroplane I built when I was fourteen, to a 21-foot sailboat built in the 1990s, and a bunch of tunnel and v-bottom raceboats since 2005. I design my boats on a "computer aided design" (CAD) program on my computer. 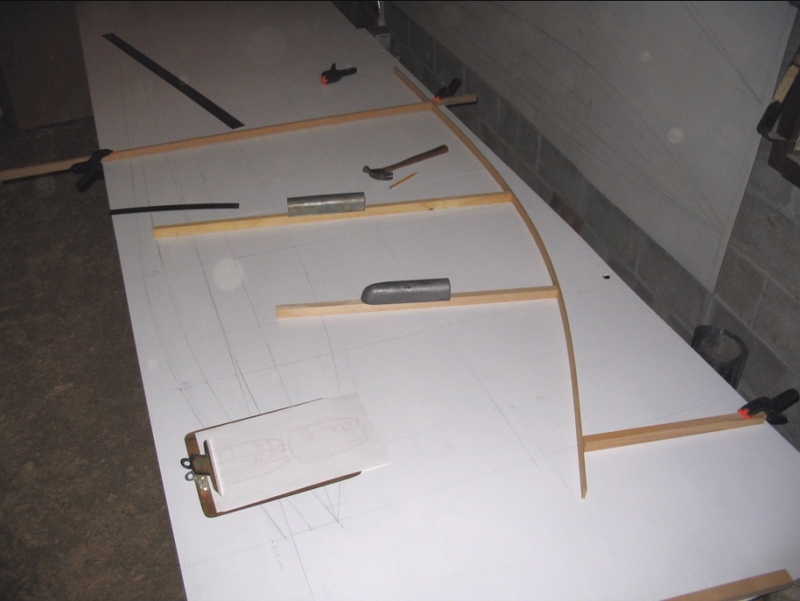 Once the basic lines have been developed, I draw the plans full-size on a loft table to ensure all curves are fair. Corrections made in the loft plan are then carried back to the CAD drawings and the plans are finalized. The resulting plans are NOT a set of blueprints or full-size drawings. The plans are (in part) a collection of digital scale drawings of all the major parts which the builder can print out on regular printer paper. (Pre-printed drawings shipped via postal mail are also available.) The drawings include all necessary measurements so that the builder can expand them full-size -- onto paper templates if desired, or better yet right onto the plywood. The plans package, available via direct download or by postal mail, includes fourteen measured drawings; a scantling list; and some notes on wood, hardware and other materials needed to complete your boat and set it up for recreational boating or sanctioned racing. Also, I provide extensive online construction notes, including dozens of photos, which will guide you through the entire building process. And, I will be just an email away if you have questions. The plans package is $55 US via direct download; or $65 printed on 8.5" x 14" sheets and sent via postal mail. You can pay online through Paypal (you do not need a Paypal account), or you may send a check or money order.